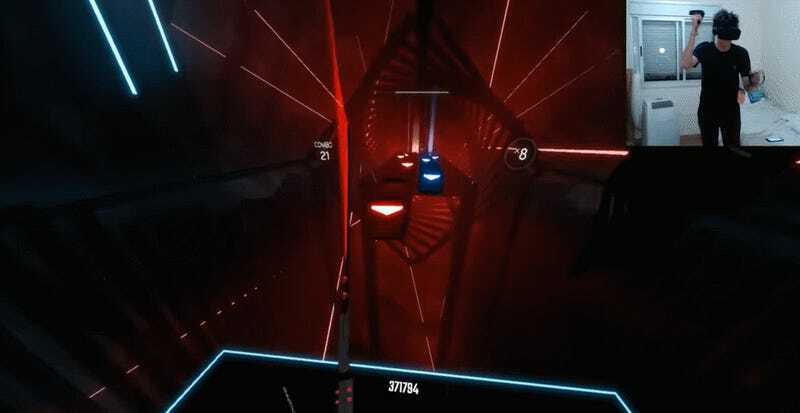 In a recent post announcing the latest update to Steam VR, one of the changes listed reads: “Increase limits of what we thought was humanly possible for controller motion based on tracking data from Beat Saber experts.” In other words: Some people are so good at Beat Saber, a rhythm game where you use lightsabers to slice correspondingly colored red and blue blocks, that Steam VR wasn’t previously able to track them. The fix to address that shortcoming affects the Vive hardware’s Lighthouse tracking sensors which are responsible for recording players’ positions and movement while playing Steam VR. In order to be more accurate Valve increased the max threshold for how quickly a player could move one of the VR controllers. To put that in perspective, rotating 3600 degrees a second is the equivalent of flicking your wrist 90 degrees, from horizontal to vertical, in .025 seconds. Like the developers at Valve, I would have guessed players with super twitch skills would be able to move fast, but not that fast. Some Beat Saber players are indeed strong with the force. You can watch Google’s gaming keynote livestream here.